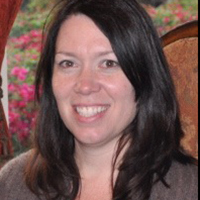 Sweet Sixteener Lois Sepahban recently spoke to Fearless Fifteener Tatum Flynn about her MG novel, THE D’EVIL DIARIES (April 2, 2015 from Orchard Books/Hachette Kids). Tatum Flynn decided to be a writer aged seven, when one look at her first attempt at a comic book made her realize she had all the artistic talent of a blind rhino. Since then she’s picked up plenty of story ideas as a croupier on cruise ships in the Caribbean, travel magazine writer riding the rapids in the Grand Canyon, English teacher in Italy, and poker player traveling the world lying to people for profit. These days she lies to people for profit as a children’s author instead, which involves less travel and more daydreaming, but exactly the same amount of bluffing. 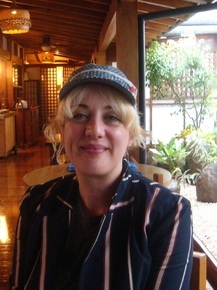 She’s secretly half-Hungarian and lives by the sea in England with a cat called Friday and too many hats. Find Tatum on her website, Twitter, Tumblr, Pinterest, and Goodreads. 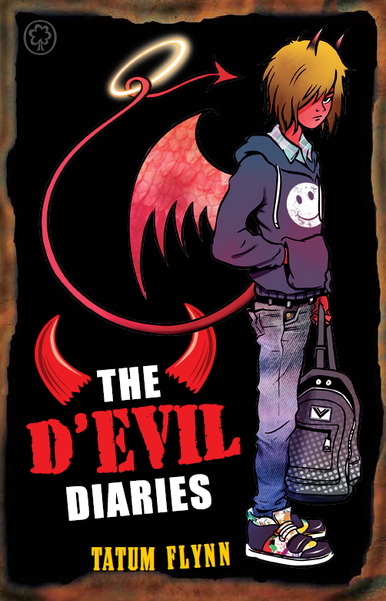 THE D’EVIL DIARIES is available for purchase at Amazon, Powell’s, and Books A Million. Lois: Are you part of a critique group? If so, how did working with your CPs benefit you? Tatum: I’ve never been part of a group, but I do have four brilliant CPs and some lovely beta readers. My first two CPs especially, Danica and NK Traver, helped me enormously, pointing out plot holes and poor writing and things that were confusing or needed enlarging upon, and also boosted me by telling me that The D’Evil Diaries did actually make them laugh. Which was a bit of a relief. Seriously, get CPs. They are *crucial*. Lois: Did you know this novel was “The One”? Tatum: Who ever truly knows? I hoped it might be. I’d written one novel previously – an MG adventure story set in Victorian London – and while I liked it, I knew that The D’Evil Diaries was more original and high concept, so I hoped it might take. But at the same time I thought a kid’s book set in Hell was probably an insane idea that no one would ever want to publish. I was actually on the verge of giving up and moving onto the next book when I got interest from my publisher. So I guess the moral is: Try, try, and try again, but in the end don’t get too tied to any one story, even if you really really *want* it to be The One. There will be other Ones. Lois: How did you find your agent/editor? Tatum: One night there was an eerie scrabbling noise at my window and I turned to see a flock of bats hovering outside in the darkness. ‘Come with us!’ they said so I followed them to a cave where… Oh wait that part of the story is classified. *Officially*, I went on a SCBWI weekend retreat where I met an editor who liked my first chapter and asked to see the full. I was, as you can imagine, Very Excited. Fast forward a few (slow, agonizing) months and they asked me to come in and meet the team, and told me they’d be taking the book to acquisitions. Shortly afterwards (I had been querying all this time) I received three agent offers, and a month or two after that we had a deal with the fabulous Orchard Books. Lois: What was your revision process like for this book? Tatum: I wrote it, tidied it up a bit, sent it to my CPs, then revised for maybe a month. Then whilst querying I got two agent R&Rs, which didn’t end up coming to anything, but did mean I revised again, including adding some sections and changing one plot point that I think improved the story quite a bit. Finally I did edits with my editor (Rosie Mcintosh, who deserves a wave for being possibly the nicest person in publishing) which didn’t exactly involve revision – it was mostly adding and enlarging. So, all-in-all, this book had a fairly easy time of it. I don’t expect all my books will be such a smooth ride. Not odd, exactly, but I guess most people would call it unusual – I was a pro poker player for many years. It was a lot of fun, and bluffing is good practice for making up stories. Big brother, little sister, in the middle, or one and only? That only child who was squirreled away in her room hiding from the grown-ups with a pile of CHOOSE YOUR OWN ADVENTURE books. Which probably explains a lot. I don’t know how people write with music playing. I need to hear the words in my head. What were you reading when you were twelve? All The Things. Joan Aiken, Enid Blyton, Richmal Crompton, Roald Dahl – plus various scary books about vampires, all THE OMEN books, and Stephen King. To name just a few. My initial impulse is robot revolution because zombies are scary as heck but robots are way smarter and more efficient and would probably wipe the human race out no problem so I’d have to actually go for zombie apocalypse, where I might stand a chance. Plus you never know, it might be the Nicholas Hoult type of zombie which wouldn’t be so bad. Lois Sepahban grew up in central California. She spent her childhood reading, climbing trees, and leading her brother and sister on hunts for buried treasures. She is married and has two children. Today, she lives on a small farm in Kentucky where she has a barn that she fills with animals who need homes: goats, dogs, cats, and chickens. In her MG historical debut, PAPER WISHES (Margaret Ferguson Books/FSG, Winter 2016), Manami stops speaking when her family is forced to move to a Japanese internment camp in 1942. To save her family, Manami must find her voice. You can find Lois on her website and Twitter.